"Having a professional billing firm working alongside you will multiply productivity and reduce waste. Stop working yourself to death on the grunt work and start making the most of your talents and expertise - consult with a billing outsourcing company to see how they can help you unlock your full potential." The continued success of your business is our goal. TPi Billing Solutions is a full-service Billing Services Provider, located in Tulsa, Oklahoma. We serve customers in most US states and in Puerto Rico and the U.S. Virgin Islands. We understand the logistics and challenges that our customers face in successfully and efficiently completing back-office functions. We can develop fully automated and custom processes to receive your billing data, produce the statements, and post payments to your bank account and billing software. TPi is also adept at producing your marketing mailings, periodical newsletters, notices and supplemental mailings at a fraction of the cost you may be currently paying. In some cases we can offer a 75% discount on postage alone. Call TPi today to streamline your costs and productivity in ways that you may not have thought possible. 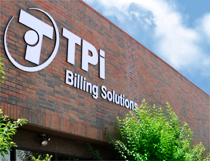 TPi Billing Solutions is a full-service Billing Services Provider, located in Tulsa, Oklahoma. We serve customers in most US states and in Puerto Rico and the U.S. Virgin Islands. We understand the logistics and challenges that our customers face in successfully and efficiently completing back-office functions. We can develop fully automated and custom processes to receive your data, produce the statements and post payments to your bank account and also update your proprietary billing software. TPi is also adept at producing your marketing mailings, periodical newsletters, notices and supplemental mailings at a fraction of the cost you may be currently paying. In some cases we can offer a 75% discount on postage alone. Call TPi today to streamline your costs and productivity in ways that you may not have thought possible. Our in-depth data processing services integrate with virtually any proprietary accounting software system. We offer secure data transmittal and fully automated data transfers and processing. Our quality assurance staff oversees Process Development and ongoing downstream processes at every phase of operations. We utilize the latest technology in high-speed variable data printing and mailing equipment, which enables us to process millions of pieces of mail every year taking care to account for and verify each one. Our state of the art remittance Lock Box processing offers up front pricing and the ability to process payments and transactions multiple times per day. What sets TPi apart is our full-service, bi-lingual customer care call center. In addition, our technological expertise allows us to offer any form of electronic presentment you may desire. This includes email, fax, online bill viewing and payment, SMS bill-pay and automatic payment plans for your customer base. We’re also available at thousands of near-by locations for walk-in payments. Copyright 2014 TPi Billing Solutions LLC. All Rights Reserved.